This article is about the Forerunner artifact. For the campaign level, see Sacred Icon. "We must collect the Index before we can activate the installation." 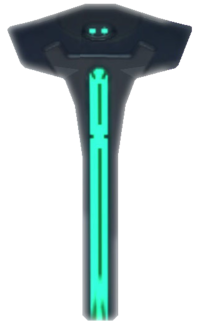 The Activation Index, often simply referred to as the Index and known as the Sacred Icon by the Covenant, is an object found in every Halo installation's Library. The Activation Index is the key needed to operate the installation's most critical systems, the most notable of which is its main weapon, an energy pulse that will kill all sentient life within the ring's effective range. Its secondary purpose is to simultaneously initiate the Conservation Measure, the repopulation process of the worlds sterilized by the Halo's pulse. An Index cannot be used to activate any Halo besides the one to which it is assigned. Cortana producing a hologram of Installation 04's activation index from her memory banks. The Index is vaguely T-shaped, with a faint green or blue glow emanating from a stripe on each side. The object seems to be merely a digital storage device containing the software or access codes needed to activate the rings, as shown when Cortana extracted the Index's data and stored it within her memory, and when she activated the second Installation 04 with the stored Index. Each Index is stored safely within an Index chamber, a large room that is located at the core of every Library on each Halo installation and guarded by waves of Sentinels. According to containment protocols followed by the monitors of each Installation, only a Reclaimer is allowed to retrieve the Index from the Library. Immediately after this, however, the Index will be taken by the monitor for safekeeping to ensure it does not fall in the hands of the Flood in the event the Reclaimer is infected. Once safely in the installation's Control Room, however, the monitor must hand the Index over to the Reclaimer, as monitors are not allowed to activate their Installations by themselves. When inserted into the Core inside a Halo's Control Room, the Index immediately initiates the charging sequence of the ring's main weapon. The activation process may be aborted by physically removing the Index before the firing; however, doing so sends out a signal which places the entire Array into standby mode, ready for activation from the Ark. An AI construct inside the Core is able to prevent the initiation of the ring's firing sequence even if the Index is inserted, as demonstrated when Cortana prevented John-117 from activating Installation 04. While inside the Core, Cortana also had complete control over the Index itself, as she was able to remove the Index's data and store it within her system. However, it is also possible to insert the Index into the Core without triggering the ring's main weapon and instead use the authorization provided by the Index to manage the Halo's custodial systems. John-117 noted in his debriefing of the Halo event that, if not for Cortana's intervention, he would have accidentally activated the weapon and destroyed all life in the galaxy. Halo's main weapon exists primarily in case the Flood manage to escape containment and spread their infection to other planets. Only one firing of the rings occurred, at the close of the Forerunner-Flood war. Immediately following the activation, the secondary purpose of the Index also came into play, triggering the re-seeding of life on the worlds whose sentient species were indexed in the records of each Installation's Library in addition to the archives on the Ark. John-117 about to take the index in Alpha Halo's Library. The activation index of Installation 04 was retrieved by John-117 at the guidance of monitor 343 Guilty Spark in accordance with the proper containment protocols after the Flood was released during the Battle of Installation 04 on September 21, 2552. Following protocol to the letter, the monitor led the Spartan through the Library until every security barrier protecting the index could be lifted. Upon reaching the facility's top floor, the Master Chief descended on the Index Chamber's central elevator back to the bottom, where the index lay suspended over the main chasm. John obtained the index from its storage casket but Guilty Spark immediately took custody of the artifact in accordance with protocol. After the two teleported to the control room, the monitor relinquished the index back to the Reclaimer as only he was allowed to reunify the index with the Core. The Master Chief inserted the index to the Core, but Cortana immediately prevented the installation's activation, having been informed of Halo's true purpose. Cortana downloaded the index's data into her systems and it remained in her possession over the coming months. On December 11, 2552, Cortana used the digital index to activate Installation 04's replacement constructed by the Ark. Commander Miranda Keyes reaches out to retrieve the index from its secure casing. During the Battle of Installation 05, Installation 05's activation index quickly became a coveted prize to the UNSC and Covenant forces clashing on the ringworld. The Covenant sought to acquire the index to initiate their "Great Journey" by firing the installation while the UNSC forces operating from the UNSC In Amber Clad attempted to gain possession of the index to prevent galactic genocide. Both groups racing to the Library, the UNSC reached the Halo's damaged Index Chamber first and Commander Miranda Keyes successfully obtained the index from its container hovering over the Library's central pit. However, Keyes and her escorts were attacked by Arbiter Thel 'Vadamee, who was then quickly betrayed by Tartarus at the Prophet of Truth's behest. Tartarus took the index to the Hierarchs who then enthusiastically announced the recovery of the "Sacred Icon" to the rest of the Covenant amidst the burgeoning Great Schism. Truth entrusted Tartarus with the index once again as he departed for Earth to journey to the Ark, with Tartarus slated to activate Installation 05. In the control room, however, the Jiralhanae Chieftain was confronted by the Arbiter and his newfound human ally, Sergeant Major Johnson. Despite being informed of the truth about the Halos, Tartarus forced the captive Commander Keyes to insert the index into the Core, initiating the ring's activation sequence. However, 'Vadamee managed to kill Tartarus before the ring could fire and Keyes rushed to remove the index from the energy stream in the control room's center, halting the installation's firing sequence but priming the rest of the Array for remote activation from the Ark. In a plan to stop the Ur-Didact, John-117 connects Gamma Halo's Index to the control room's core. ONI pioneer teams retrieved Installation 03's activation index weeks after the UNSC discovered the ring. It was stored in a laboratory aboard the orbiting Ivanoff Station by July 2557. The index came into the Ur-Didact's possession after he returned to Gamma Halo following his defeat in the New Phoenix Incident. The index fell from the Didact's hands when he was incapacitated and translocated away by 859 Static Carillon and was subsequently obtained by John-117, who took it to the installation's control room not to fire the ring, but to disable the Halo's safety protocols. This allowed Static Carillon to detach the entire plate section of the Halo housing the control room and plunge it on the Composer's Forge in order to vanquish the Didact. The Index resembles common depictions of Mjölnir, the hammer of the god Thor in Norse mythology and the namesake of the MJOLNIR Powered Assault Armor. In the beginning cutscene of the campaign level The Library, the container holding the Activation Index unlocks, revealing it for two seconds before the animation by what is seen appears to have restarted since the Index seems to disappear as if the container was never even opened. This might have been caused by a scripting error. On the level Composer in Halo 4, Installation 03's Index can be seen within a display case in a Hunter-occupied laboratory on Ivanoff Station. The item is accompanied by a short researcher log. The Activation Index of Installation 04 in holographic form. John-117 approaching the Index of Installation 04. John-117 holding the Activation Index in his hand. John-117 with Alpha Halo's Index in his hand. Miranda Keyes inspecting a hologram of an Index. Miranda Keyes reaches for the Index, in its floating container in the Installation 05's Library. The Prophet of Mercy looking at a holographic projection of the Index. The Prophet of Truth displays the Index to the Covenant. Cortana presenting the Index in holographic form. The Prophet of Truth announces the Index's retrieval to the Covenant in Halo 2: Anniversary. The Activation Index of Installation 03 aboard Ivanoff Station. Concept art of the index in Halo 2: Anniversary. ↑ 1.0 1.1 1.2 Halo: Combat Evolved Anniversary - Library, "Activation Index"